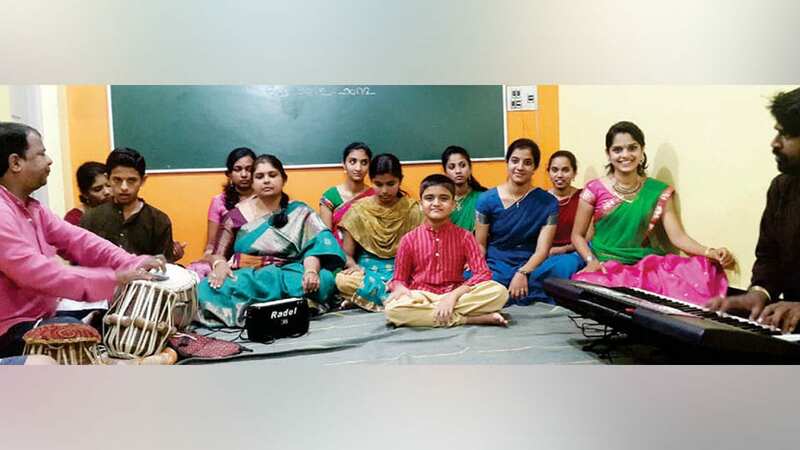 On July 23, Nadavidyalaya Academy of Music and Dance had organised its third monthly musical evening at Hootagalli where the Vidwat grade students of Guru Vid. M.S. Naveen performed. They were accompanied by Vid. Jagadeesh on tabla and Vid. Purushottam on keyboard. This musical evening was dedicated to the Saint-Poets (Daasa) and their compositions, hence the name Daasa Namana. The presentation started with Ganapati devaranama ‘Gajamukha Vandisuve’ composed by Sri Vaadiraja in Nata raga khanda chapu taala. The next devaranama was ‘Hoova taruvara manege hulla taruva’ set in Bhimpalas raga khanda chapu taala composed by Purandaradaasa. Later was Purandaradaasa’s famous ‘Raama raama raama seeta raama enniro’ set to tillang raga trishra eka taala followed by Annamaacharya’s ‘Shrimannarayana shripaada me sharanam’ in bhouli raga aaditala filled the hearts of the audience with bhakti. This was justified with another devaranama of Purandaradaasa ‘Ithange iruvenu hariye enna doreye enna poreye’ in malahari raga trishra eka taala, carried on with Vijayadaasa’s composition ‘Sadaa enna hrudayadalli vaasa maado shri hari’ in pantuvarali raga roopaka taala. The concert continued with the famous work of Purandaradaasa ‘Tarakka bindige’ in tillang raga trishra eka taala followed by ‘Elu hanumantha estu nidde,’ an enchanting composition of the same set in bhouli raga mishra chapu tala. Purandaradaasa’s ‘Pillangoviya cheluva Krishnana elli nodidiri’ in mohana raga trishra eka taala lit up the surroundings with Krishna’s charm.